Earlier tonight I was changing the water in my fish tank and, as I normally do, I was listening to some tunes on my iPod while doing the maintenance. I was wearing gym shorts and had the iPod in the back pocket, with the Apple earbuds running up my back and going into my ears from the back, so that they would not interfere if they were in the front. I’ve done this many times before without issue. After finishing up the tank maintenance and putting everything away, I went into the bathroom to wash my hands. While I was bending over the sink washing the soap off my hands I felt a tug at my ear, the music stopped playing, I heard a ding, then a splash. I quickly looked over at the toilet next to the sink, my heart sank, and several expletives unconsciously lept out of my mouth. 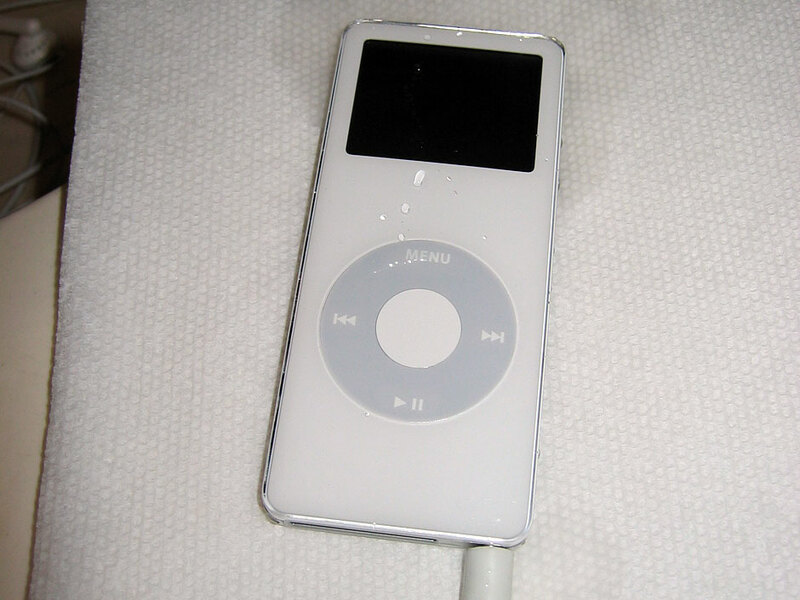 For there, lying deep in the toilet, was my five week old white iPod nano. I thought about reaching in pulling the iPod out, but my phobia of electricity took over. My mind must have said, “Wait! iPod has a battery, battery has electrical charge, water is good conductor of said electrical charge, DON’T TOUCH IT!! !” With my luck, I would get electrocuted and it would be all over the news. “Moron gets electrocuted by his iPod. Story at eleven!” would be the TV teasers. “iIdiot gets iKilled by iToilet” would be the Daily News headline, while the Post would just have the one word, “iDumbass”. It would be hell for my mother, because for the rest of her life, whenever she made dinner reservations, someone would recognize her last name and bring up the fact that her son was killed fishing an iPod out of a toilet. She would never live it down. After about 30 seconds, the display flickered and went off. After a few more expletives, I realized that this was all the fault of two guys I work with. Earlier in the day, they were asking me about some of the boneheaded things I’ve done (like fall out of bed) and making fun of me. They jinxed me. They gave me bad karma. It was their fault and they were going to have to deal with my wrath. I took a few pics to remember this incident and rub it in their faces. It was during the photo shoot that I realized that the headphones did not completely fall into the toilet with the iPod, so I used the dry part to fish out the iPod, using toilet paper to actually grab hold of the soaked device (I figured that toilet paper couldn’t be a good conductor of electricity). I shook it off and laid it on the sink face up. I’ve dropped electronic devices in water before, and I know that as long as it’s fresh water, and you let things dry out completely before trying to turn the device on again, it will sometimes work fine. With that in mind, the iPod has been placed in the kitchen near the window to try and help it dry out. Today is Tuesday. I figure four days is a good time frame to let it dry out. I’ll give it a try on Saturday to see if it can be salvaged or if it’s a total loss. I have resisted temptation to try the iPod for several days, and today was the day that I said would be enough time for it to dry out. In my mind, if it wasn’t dry after four days, then it wasn’t going to get dry. I went into the kitchen, picked it up, and carried it into the living room. I pressed the “play” button and watched the display do nothing. I pressed it again, and again, nothing. Damn. Then, for grins, I pressed the “Menu” button, and to my delight, the display lit up with the Apple logo. It was not backlit, but it was on. After a few moments, the display showed a large battery with one bar on it. It didn’t do anything else. I assumed that that meant that the battery was low. I went over to the computer and plugged the iPod in. This display lit up and displayed the red circle with the slash thought it and the warning to not disconnect. Good sign. Very good sign. iTunes on the computer found the nano and synced with it, as if there was nothing wrong. After it finished syncing, I ejected the iPod from iTunes, but left it connected to the USB cord so it could recharge the battery. I picked up the iPod and started to try to use it. The menu navigation was a bit weird. Sometimes it jumped very quickly between menu items and other times, it didn’t move at all, but when selecting a playlist to play, it played without a problem. Yay! The display looks a bit weird. It looks like half the display in the center is a different shade or intensity than the surrounding area. I guess the display still has a bit of water in it. I guess the weird menu navigation is also due to water interfering with the sensor. I tried to get a pic of the display, but it didn’t come out. I’m going to leave it plugged in for a while and see if the battery charges and if it will work off the cable. Today was a good test for the iPod. When I woke up, the display of the iPod was back to normal. The scroll wheel was also functioning fine. 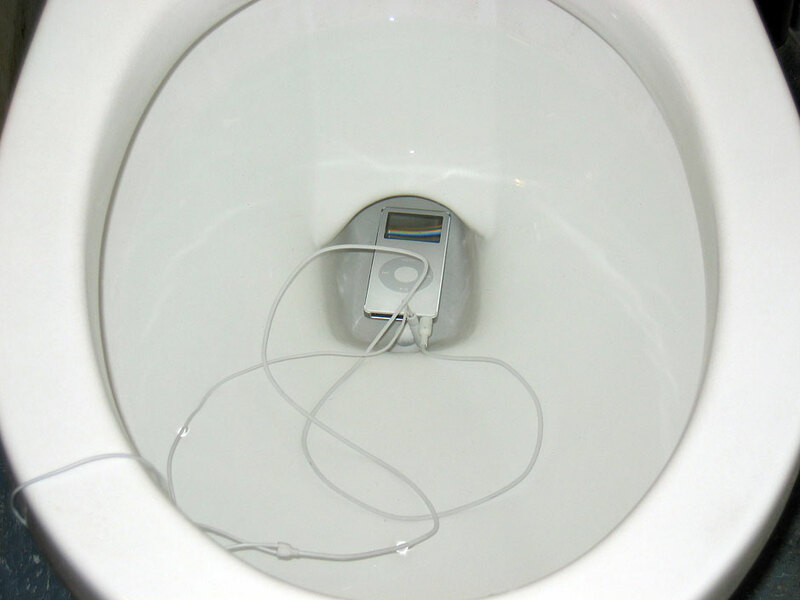 If I didn’t know that this iPod had been in the toilet for a few minutes, I wouldn’t know there was anything wrong with it. I had to go into the office today and used the iPod for the 25 minute walk there without a problem. After finishing in the office, I walked to the fish store and back to the office (total of 60 minutes) and the iPod functioned flawlessly. I also listed to it on the way home from the office without issue. I’ll need to test it for a few more days before I feel it is fine, but with today’s test, it worked flawlessly. Well, it’s been more than a week since the incident and it seems to be fine. One thing I have noticed is that when I go out in the morning, and I go to turn it on, pressing the “play” button does not do anything. I have to press the “menu” button, have the Apple logo show up for a moment, but then it goes back to exactly where it was when it was last shut off, even if it was in the middle of the song. I don’t remember if it did that before the incident, but I know that the regular iPod does not do that.